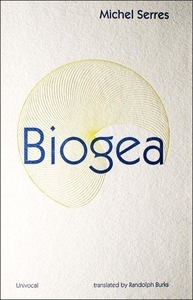 Biogea is a mixture of poetry, philosophy, science, and biography exemplary of the style that has made Michel Serres one of the most extraordinary thinkers of his age. His philosophical and poetic inquiry sings in praise of earth and life, what he names singularly as Biogea. In these times when species are disappearing, when catastrophic events such as earthquakes and tsunamis impale the earth, Serres wonders if anyone "worries about the death pangs of the rivers." And for Serres, one can ask the same question of philosophy as the humanities increasingly find themselves in need of defenders. Today, all living organisms discover themselves part of this Biogea. "Today we have other neighbors, constituents of the Biogea: the sea, my lover; our mother, the Earth, becomes our daughter; this beautiful breeze which inspires the spirit, a spiritual mistress; our light friends, the fresh and flowing waters."